After a heavy night, the night before we’d had to check out of our Cusco hotel at 9.30am and spend a day waiting around for our 8pm bus. 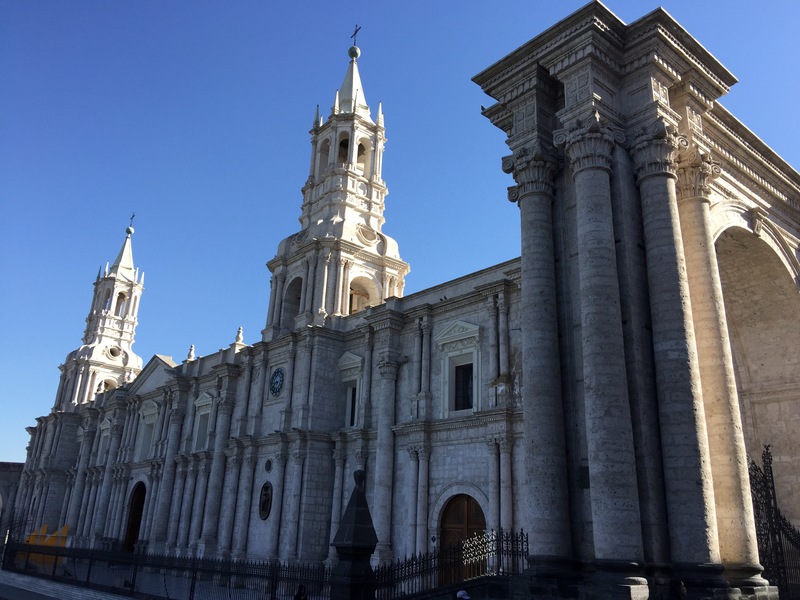 Our marathon eleven hour coach arrived in Arequipa, Peru’s second largest city, at 8am on a Tuesday morning. We were all exhausted after a cramped night, winding endlessly through mountain passes. Typically, our early arrival meant it would be several hours before we could check into our hotel. After depositing our bags at the hotel, we headed out for a breakfast of pancakes and bacon and eggs. Re-energised the majority of the group joined Kantu for an orientation walk. First stop was the beautifully manicured main square, which features a spectacular Cathedral and colonial arched terraces on three sides. 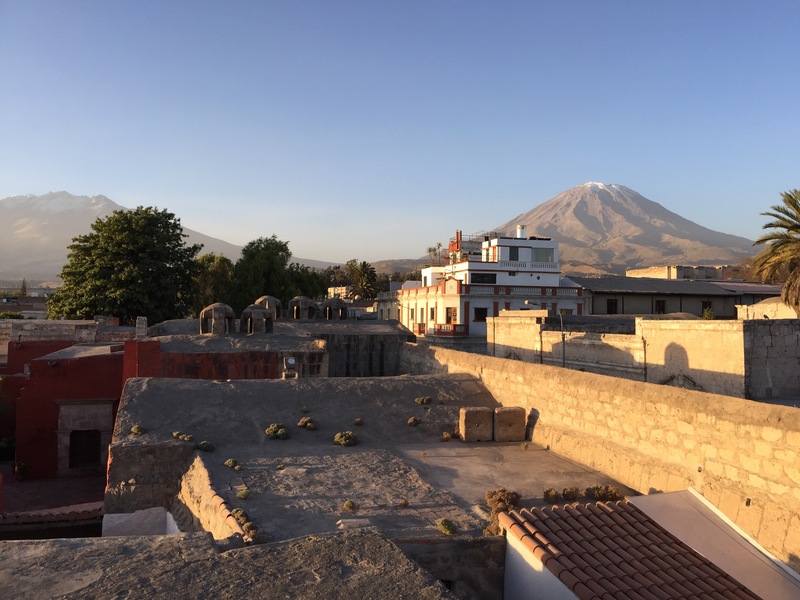 Arequipa is know as the ‘white city’ due both to its colonial history and the white Sillar volcanic rock which much of the city is built from. 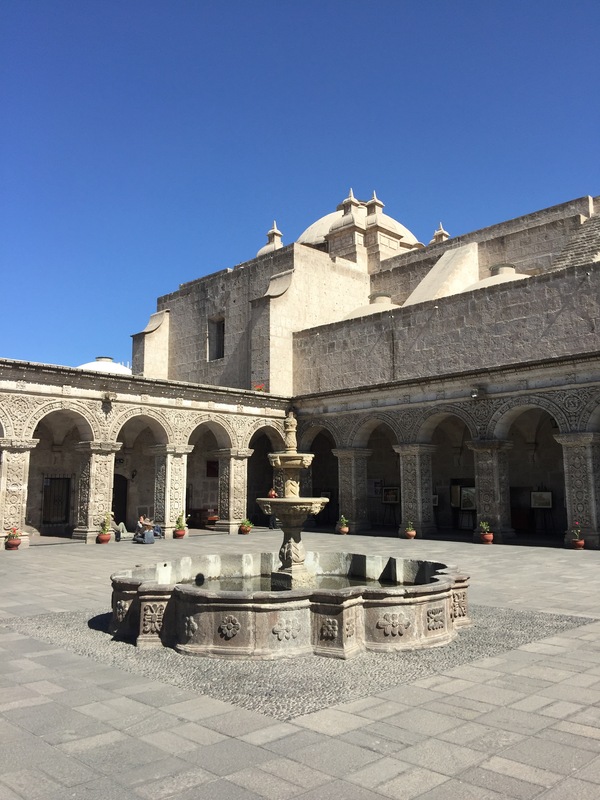 Kantu pointed out the main highlights of the city, which we could visit ourselves in the afternoon, including Wanita – the world’s best preserved mummy and the Santa Catalina Monastery, a convent which is still home to an order of nuns. Next we entered one of the historic Cloisters, where we got spectacular views of the city and snow capped volcanic peaks in the distance. After the Cloisters we took a quick look around a Jesuit Church, full of ornate murals and religious paraphernalia. As with other religious sites we’ve visited, it was a further reminder of the obscene wealth of religion. From the church we headed to the local market, where locals can purchase anything from dairy and raw meats, to toys, fruit and pet essentials. We stopped at the fruit section and tried some of the local fruits, which to westerners are alien. Amongst them the ‘prickly pear’ from the local cactus which is a sweet, almost mango textured, local delicacy. 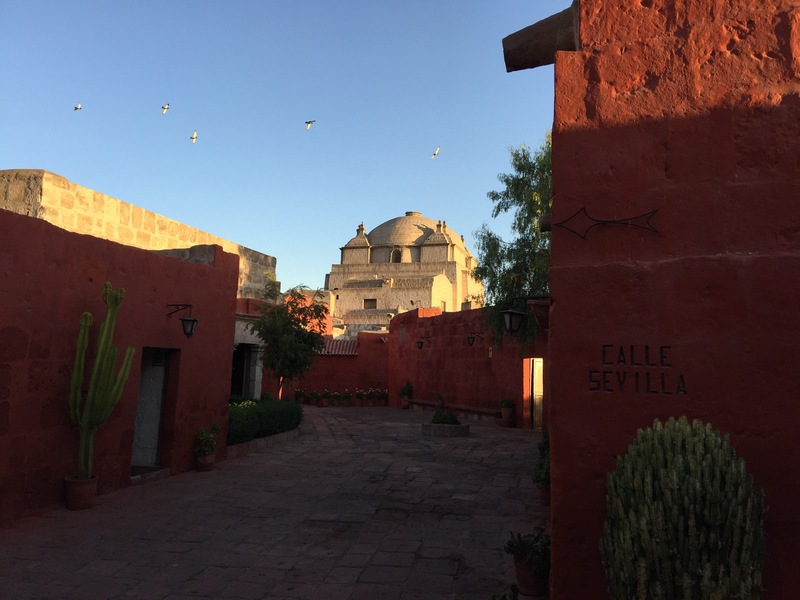 After the market, most of the group decided to visit Wanita – while we decided on going to visit the Santa Catalina Monastery, a walled ‘city within a city’. At S$40, entry to the 5 acre site isn’t cheap but it’s fascinating maze of streets and small outbuildings are stunning at sunset. The brightly coloured blue courtyards and rich red streets, lined with pot plants and cactuses provide fantastic contrasts against the afternoon sky. From the Monastery we headed back to the Square to meet the rest of the group for sunset drinks at the Top Terrace bar. Whilst the food is apparently not great, drinks were reasonably priced and the view of the Cathedral was fantastic. With the sun having set, and temperature dropping we headed to the Romano Italian restaurant for pizza and a glass or two of wine. The restaurant was a Trip Advisor recommendation and the food was good quality and reasonably priced for S$32-42 for a large pizza (£8-11). Whilst it had only just gone 9pm, everyone opted for bed after a long day and knowing that we had yet another early start the next morning – a five hour bus to Chivay.